Dock-N-Talk Cellphone Docking Station | OhGizmo! By Andrew Liszewski on 05/09/06 • Leave a comment! Having a landline at home is quickly becoming a thing of the past. With a lot of people getting internet through their cable TV provider, and with local and long distance cellphone plans becoming ever cheaper it doesn’t make sense to maintain a traditional home phone. However as everyone knows cellphone reception indoors can be spotty at times. The Dock-N-Talk allows you to keep using your full-sized home phone but with your cellular service instead. Simply connect your mobile phone to the Dock-N-Talk station VIA bluetooth (or with a cord) and then make sure the dock is positioned in an area of your home where the cell service is strong. You can then place and receive calls on your cell provider’s network with the convenience and audio quality of a full-sized handset. The Dock-N-Talk station also charges your mobile phone while it’s connected ensuring the battery is always full. 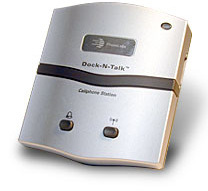 The Dock-N-Talk is available on the Phone Labs Technology website for $139.99.